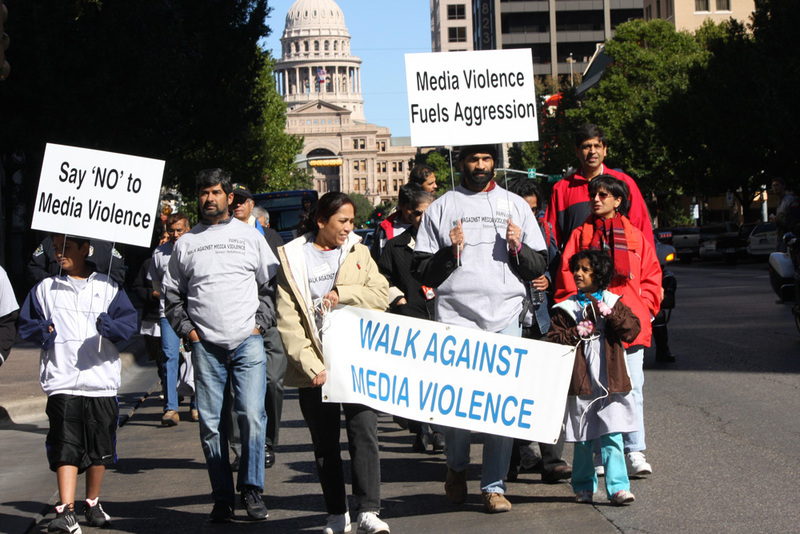 Media Violence and Video Games – Where Do We Draw The Line? The average U.S. household owns at least one dedicated game console, PC, or smartphone. 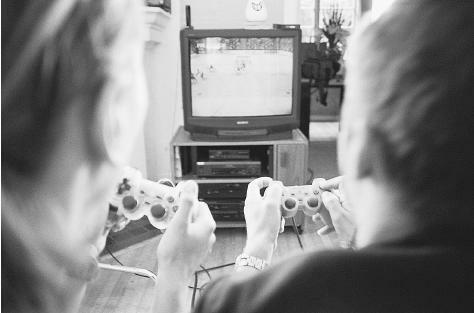 49% of U.S. households own a dedicated game console, and those that do own an average of 2. 53% of gamers are male, 47% are female. The average age of the frequent game purchaser is 35 years of age. Of U.S. households that own dedicated game consoles, PC, smartphone, dedicated handheld system, or wireless gaming device, 70% play on their console and 65% on their PC. Simplified, all those numbers mean that there are a lot of gamers in United States. 49% of U.S. households own a dedicated game console, PC, or smartphone. That means almost half of the United States plays some form of video game on average. So why aren’t there more violent crimes? I mean, if video games make people violent then half the population of America is violent killers and/or crime commiters. 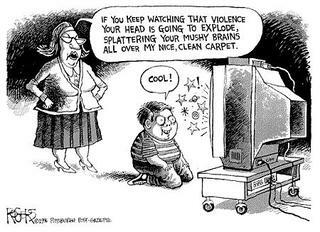 Plenty of studies have been done to prove or disprove the effects of video games on the mind, specifically the part of the brain that causes violent behavior to take place. It takes a great deal of time to find the right studies online, part of them are done by first-party companies and therefore cannot be fully trusted in my opinion. Another portion are helpful, but only somewhat by saying things along the lines of “yes they affect the brain” but not specifically linking that affect on the brain to violent crime. Most are not actually studies at all but rather news reports that are full of hear-say and no factual evidence. The few that are helpful still don’t directly link violence and video games. That isn’t just my lack of findings or the internet not showing the studies, it that there aren’t any studies as of now that truly and indefinitely say violent behavior is or is not linked to violent video games. It’s just something that, until recently, was not taken as seriously. Vice President Biden has issued a call for studies to be done on video games and their effects of behavior in light of the devastating Sandy Hook massacre, which is what sparked all this recent talk about video games making people violent and gun control in the U.S.
For far too long lawmakers have been saying “violent video games cause real world violence” despite nothing backing up that statement. Unfortunately, there’s nothing concrete to disprove that either, as results of studies so far have been inconclusive. …it is probably the case that if you have a kid playing Call of Duty for six hours at a time, he might come out of the other end of that acting a bit more aggressively. But the leap from “aggression” to true violence is an enormous gulf. There’s a difference between being slightly on edge after a rousing gaming session and going out and murdering a whole bunch of people. It’s true that the differentiation between aggression and violence has not been touched on by popular news reports. When a massacre or murder occurs at random, the news jumps straight into the “he must have played video games” excuse as if there could be no other cause for the act. Being aggressive and being violent are very different. Varies studies have proven that video games affect the part of the brain that controls emotions and aggression, which might make someone jump the gun (so to speak) and say that is proof of video games being related to violent behavior. Again, aggression does not equal violence. I’m sure that driving in commuter traffic here in California causes activity in that same area of the brain, but you don’t see people jumping out of their cars and shooting other vehicles everyday. A rude worker at a store can probably make someone aggressive as well, but people don’t go killing every person who is rude to them. Another point I’d like to bring up is that video games are not the only form of violent media. If video games are to blame then other violent sources such as movies, music, television programs, and even news channels need to take the blame as well. I personally find slasher flicks like Jason to be more horrifying and violent than most games. There is just something about seeing it really happen (by that I mean with actors not computer animations) that makes it worse, for me at least. I can play a game like Amnesia all day long and sleep just fine, but if I were to watch Nightmare on Elm Street I’d be up all night. Even basic action movies like The Expendables depict realistic violence through explosions and people being shot or maimed. Music hold part of the blame as well, and this one seems to slip everyone’s mind. Various genre’s of music are known for violent themes in typical songs. Songs about beating up opposing gang member, killing enemies, or even songs about real life incidents of violence such as war are all just as violent lyrically as a movie or video game is visually. Television shows and news media do have more limitations in America is a certain level of violence cannot be shown on daytime television but think about the subject matter. Take a look at AMC’s The Walking Dead, zombies and humans are killed constantly and some in extremely violent ways (i.e. smashing a head in a car door). The news constantly shows images of war and violence here in America as well as in other countries such as Lybia and Egypt, as of late. Something important about all of these media sources is that all of them are subject to some form of rating system which is put in place to protect the people. Games all have ESRB (Entertainment Software Ratings Board) ratings so if a game is rated M for mature a parent needs to be present if the buyer is under 17 years of age. Movies have ratings as well, R rated movies are not supposed to be accessible to people under 17 years of age unless a parent is present. Violent or vulgar music albums will have an “Explicit Content” rating on it. Television shows also have ratings, though it’s harder to monitor since children may have access to a television at any time in the house. These ratings are mainly to keep youth from purchasing or viewing content which may be harmful to them, mentally. Before age 4, children are unable to distinguish between fact and fantasy and may view violence as an ordinary occurrence. In general, violence on television and in movies often conveys a model of conflict resolution. It is efficient, frequent, and inconsequential. Heroes are violent, and, as such, are rewarded for their behavior. They become role models for youth. It is “cool” to carry an automatic weapon and use it to knock off the “bad guys.” The typical scenario of using violence for a righteous cause may translate in daily life into a justification for using violence to retaliate against perceived victimizers. Hence, vulnerable youth who have been victimized may be tempted to use violent means to solve problems. Starting in youth, these children are affected negatively (unbeknownst to them) by violence in the media which can lead to violent acts further on down the road. It’s true that when violence is constantly being portrayed as a typical means to an end by film, game, and television heroes it may seem normal to act that way in a child’s eyes. This makes it all the more important for parents to take the time to censor certain things from their children and make sure that when violence is shown that their child knows that it is never ok to chastise, hit, or kill another person. When parents themselves act violently it’s even more difficult for children to understand that violence is not the answer to everything. For example, if a 5-year-old child sees his dad constantly get his way by yelling at clerks and other workers, the child will eventually think that since dad acts violently and threatens other the outcome is good. It’s called “modelling” and it’s something that children often do with parents, close family members, heroes, and anyone who the child may look up to. The point I’m trying to make here is mental health based off of childhood exposure to violence and/or mental disorders can have an outrageously important impact on whether or not that person will act out a violent act. What is overlooked when it comes to these violent acts is the mental state of the person acting them out. The media is violent, sure, but you may be thinking “well yeah, but I’ve never been a violent person and I’ve played video games and watched violent movies all my life” and that may be true, but do you have a mental illness or personality disorder? Something like antisocial personality disorder paired with a violent video game can create a real issue, one that may (and often does) result in violent behavior. A person with antisocial personality disorder is not simple one who dislikes social interaction or social situations, as its name may suggest, it’s much more than that. Antisocial personality disorder causes people to have “a long-term pattern of manipulating, exploiting, or violating the rights of others” and the behavior is often criminal. Imagine a person struggling with that their whole lives while also being exposed to violent media – it’s not good. Personality disorders are often present in people who commit the most violent of crimes. So here we are, at the end of this article. The question posed in the title has been answered by me with my opinions as well as a few facts. In conclusion, violence cannot be solely blamed on video games as it often is. There are various other just as violent sources of media which may even be more readily available to the public than a video game. It’s important for parents to be parents and protect their children from harmful media sources as well as instill the knowledge that violence is never ok into the minds of their children. Mental health plays a large factor is most violent crimes, the average person may be able to watch a violent movie and feel no effects but someone with a serious mental condition may be affected by it in a strong way. It slips the minds of the people reporting mass murders that this country has some serious flaws with its mental healthcare support. It’s not the easiest thing in the world to get help for a mental condition when you don’t have health insurance. Reform to the healthcare and mental health systems needs to happen more than most people think, or want to believe. The issue of violence doesn’t come down to a video game or even a gun, it comes down to people. Humanity is not perfect and humanity is violent as a whole. To me, it’s more surprising that more violent crimes don’t occur. Our species has a long history of genocide, war, and violence against its own kind. No other species is capable of performing such continuous violent acts on its own kind, it’s a wonder that things aren’t worse in the world today. We have to defend our own minds and minds of our children lest we become increasingly violent in nature. It’s time to take some sort of stand against the media’s portrayal of violence and it can’t just be against video games. What are your opinions on the matter? Be sure to comment below and let me know what your thought are on video games and media violence. Thank you for reading. This was an excellent read, well said Lady. I agree on all the points you made. The blame game always takes place after something awful like this happens. Anti-gun activists blame gun control, the NRA blames video games, etc. There is a lot of ignorance being spewed by the media about video games. It’s just part of the growing pains that many creative mediums experience at one point or another. Thank you for reading! I think it’s hard to live in a world like this were something or someone must always be blamed and it’s hardly ever correct. I hope for change but you never know what will happen, with all the stubborn people in this country I feel like we are going backwards. Really great article and a well-thought out piece. I agree with everything you said. I kind of touch upon the same things you have said when I wrote my own piece about violence and video games not too long ago. The argument of blaming all violent behavior on video games is extremely flawed. You can’t blame one medium without looking at other forms of media that depict violence in some way every day. Articles have been written where the studies of video games in relation to violent behavior is split in the middle. Some studies say it does affect behavior and others have said there is no conclusive proof. The only thing both studies had in common was that video games does cause a level of aggression, whether it does or does not compel someone to shoot or hurt someone is a whole other matter and difficult to explain. It does come down to someone’s personal and mental history. A killer who plays violent video games is just one piece of the big picture. Even then, it’s such a small part to really have any major impact on why someone does something horrific in our society. 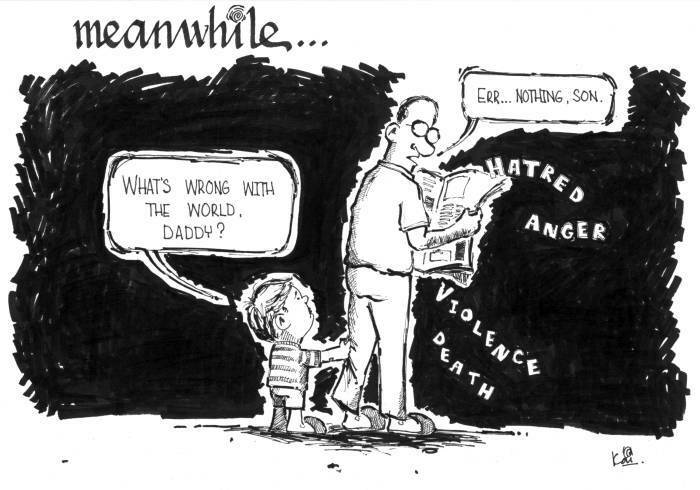 The fact that politicians, the public, and the media want a scapegoat for every bad thing that happens in our world can’t just blame one form of entertainment without looking at everything else. Thank you very much. I am hoping that Biden’s push for more accurate studies to be done on this subject will turn out something conclusive for once. It’s a waste of time for people to focus one one thing that may not even be true and not focus on the real problem. Phenomenal piece. The media and the public at large will always look to a scapegoat and gaming seems like just as good a whipping boy as any. Thanks man! It is sad that the public chooses video games as that scapegoat when there are other forms of media they could be using but I think the problem is that the people criticizing video games don’t play them, I mean no one wants to talk down about a thing they like such as movies or television shows. Maybe one day it will get better, but who knows.